15 August 2016. Medical researchers developed a technique with genome editing to negate the effects of a mutation that causes inherited blood disorders like sickle cell disease. The team from St. Jude Children’s Research Hospital in Memphis, with colleagues from other institutions in the U.S., U.K., and Japan, describe their advance in today’s issue of the journal Nature Medicine (paid subscription required). Mitchell Weiss, who chairs St. Jude’s hematology department, and colleagues are seeking more options for genome editing to address inherited blood diseases. Sickle cell disease is one of those conditions, a genetic blood disorder affecting hemoglobin that delivers oxygen to cells in the body. People with sickle cell disease have hemoglobin molecules that cause blood cells to form into an atypical crescent or sickle shape. That abnormal shape causes the blood cells to break down, lose flexibility, and accumulate in tiny capillaries, leading to anemia and periodic painful episodes. Sickle cell disease is prevalent worldwide, and affects 70,000 to 80,000 people in the U.S., including about 1 in 500 people of African descent. Beta thalassemia, a genetic blood disorder that reduces production of hemoglobin, causing pale skin, weakness, fatigue, and more serious complications, is more prevalent in tropical and subtropical regions of the world. In their study, the team applied the genome editing technique Crispr, short for clustered, regularly interspaced short palindromic repeats. Crispr is a technology based on bacterial defense mechanisms that use RNA to identify and monitor precise locations in DNA. The actual editing of genomes with Crispr uses an enzyme known as Crispr-associated protein 9 or Cas9. With this approach to Crispr, RNA molecules guide Cas9 proteins to specific genes needing repair, making it possible to address root causes of many diseases. In people without the mutation causing sickle cell or beta-thalassemia, transitioning from fetal to adult hemoglobin does no harm to blood cells. In people having the mutation, however, adult hemoglobin containing the disease traits replaces fetal hemoglobin, with damaging effects on blood cells and delivery of oxygen to tissues in the body. Some people with the sickle cell or beta-thalassemia mutation, however, do not suffer from damaged blood, due to their continued production of fetal hemoglobin. The researchers used Crispr to edit the genes producing fetal hemoglobin to resemble the conditions in people with the mutation causing genetic blood diseases, but also producing fetal hemoglobin. In their study, Weiss and colleagues edited the genomes in blood-forming progenitor cells, to maintain production of fetal hemoglobin after the transformation from fetal to adult blood cells. The edits took place in the section of DNA controlling blood cells, removing a short section that turns off fetal hemoglobin. The team tried the technique in proof-of-principle lab tests with blood progenitor cells from people with sickle cell disease. Results show the edits succeeded in switching back on production of fetal hemoglobin when the progenitor cells transitioned to adult blood cells. 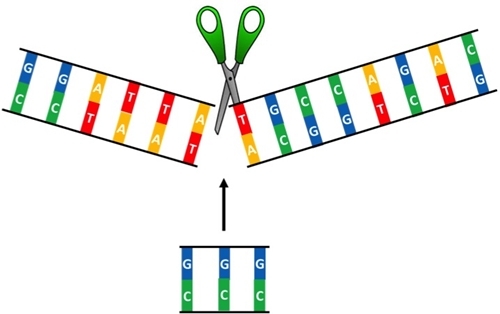 The authors note that their technique is one of several methods, including others with Crispr, to address mutations causing these inherited blood diseases. None of the techniques have yet been tested in humans, and may eventually need to be evaluated head-to-head for safety and effectiveness.